FDA (Food & Drug Administration) Material Compliant Pumps are ideally suited for a variety of food processing, pharmaceutical and cosmetic industry applications. The pumps are available in 1″ through 3″ ball check valve designs and a 2″ (line size solids handling) flap check valve design. Variable flow capacities across the range are 0–235 gallons per minute. 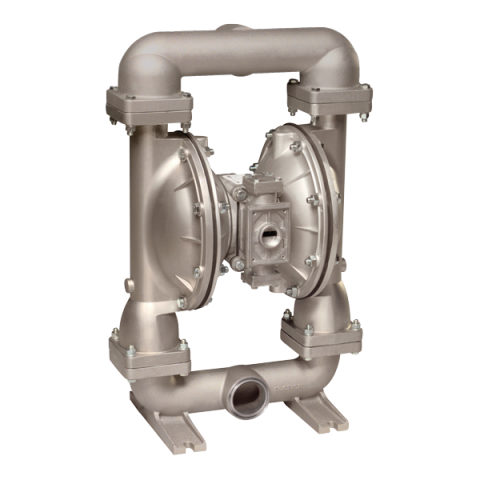 These special duty pumps are constructed of FDA compliant material components of Stainless Steel (wetted castings) and a selection of FDA Santoprene, FDA Nitrile and PTFE diaphragms, check valves and valve seats. Standard non-wetted components are white epoxy coated Aluminum with stainless steel hardware. 1″, 1½” and 2″ pumps are offered with sanitary clamp fittings and 3″ pumps are offered with an ANSI flange. Click here for T20 Metallic Pump Data Sheet.